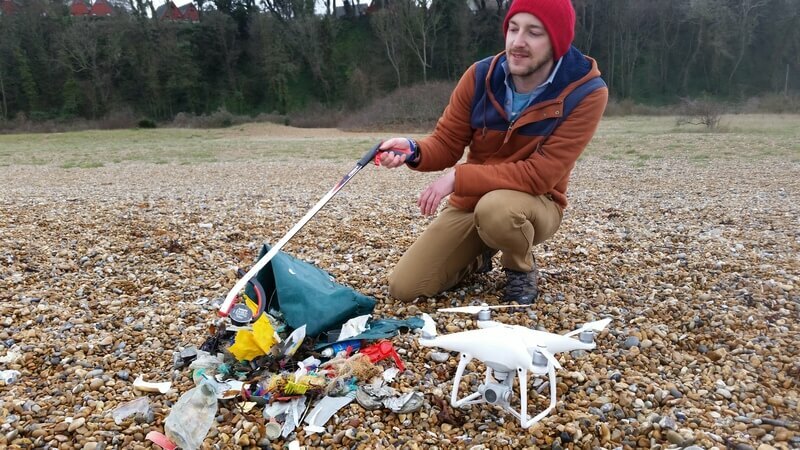 An interview with The Plastic Tide, an environmental group using drones to fight beach pollution. How did The Plastic Tide come about? Growing up in Kathmandu Nepal, a good 4,500ft above sea-level on the roof of the world, the flat blue horizon of an ocean has always held a fascination with me. In 2008 I got my first chance to explore that fascination; I took a year out and travelled across the South Pacific. On the Tongan Islands I met captain of a yacht who invited me aboard to sail across the South Pacific - how could I say no? Ove the next four months I sailed across the ocean, hopping between islands, visiting an enchanting paradise that few had ever been to before. At the same time, it was clear this was a paradise under siege. Remote beaches thousands of miles from human civilization were covered in litter; toothbrushes, flip flops, combs, and other plastic debris. This troubled me deeply, how could this happen? Where was all this litter coming from? How much is out there? In 2009 I returned to the UK, but back at my desk job, these questions kept repeating themselves and I had no answers. Not being a marine biologist or scientist, I set about attending as many ocean-based events I could find. I began to build a deeper understanding of just how serious this problem, yet how little it was understood. This problem was not just affecting these remote islands but coastal communities all over the world! In late 2015 I met with some friends in a London pub, and over a few pints we were trying to come up with ideas to win a grant expedition. Suddenly it struck me! This was a global problem that spans geographical cultural, economic and political boundaries. Therefore, if I could journey from South Africa north along the West African coast to Western Europe and up to the tip of Europe in Finland. I would find ways to tell this story in an accessible way and gather data to help with the scientific understanding of the extent of the problem. What was your approach when you started? How has that evolved over time? Initially the idea was to run a series of beach cleans as I drove north from South Africa, surveying and removing the litter. The litter would be collected in a trailer to show what kinds of was found and what volumes. But the idea had to key problems: First, I was going to need a lot of trailers, and second, I had no way to quickly and affordably collect the data I needed to tell the story. When did you start using drones? How has this technology changed your approach? The trailer problem could be solved easily by engaging with local communities and governments along the way. However, the surveying problem remained, how could I collect data quickly and cheaply enough? Then it struck me, I could use drones! I had already seen the potential for drones in everything from filming to disaster relief. Cost effective, lightweight, quick to deploy, with powerful cameras and the ability to cover relatively large areas in minutes rather than hours. It seemed to be a great solution to the surveying problem. Still, trawling though tens or even hundreds of thousands of drone survey images of beaches to identify the litter and plastics seemed a bit unrealistic. Also wasteful, as it would potentially need to be repeated surveyed again. It seemed like I need a system that could learn what litter looked like, but I had no idea how to build that. In early 2016 I asked for hlep from Dirk Gorissen, a friend and tech guru. He suggested machine learning, an approach to artificial intelligence that learns from images to identify and classify objects. This seem liked it might be an ideal way to solve the problem, and Gorisen became a trustee of my new charity. 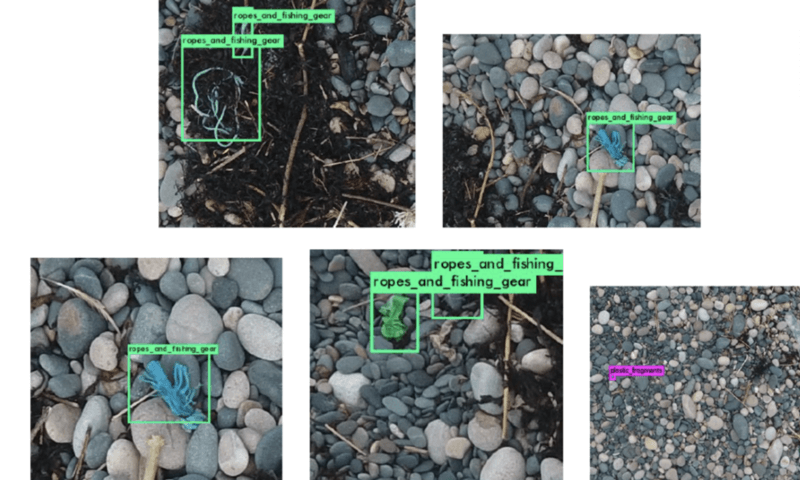 To train the AI, we would need a large amount of images with litter tagged to teach the algorithm to find the plastics. This would mean a big exercise surveying as many different kinds of beaches as possible with a drone. Cost limits meant we had to focus on the on the UK coastline – which unfortunately has just as many litter strewn beaches as any other nation. We knew we would need a versatile and stable drone to do the survey work and there was only one that had could do the job on the market at the time – the DJI Phantom 4. Still, surveying all these 30 beaches would beyond my piloting skills, so Ellie Mackay, a friend and now a trustee as well, offered her flying experience. With Ellie, an experiened pilot and STEM advocate, we tested the survey methods. She found that we could get more detailed imagery by using manual flight modes to survey beaches at lower altitudes. A challenging undertaking but not a problem for her and it enabled us to capture detailed imagery of beaches we needed for the next stage. With the imagery, made possible with a great drone platform and pilot, we could use citizen science to engage the public in the problem. Volunteers worked to tag plastics in the images. This not only trained our algorithm, we found that many users reported that the process had made them much more aware of litter in the environment in general. We gathered 14,000 images from beaches across the UK and to date have collected of 4 million tags from over 10,000 volunteers - a humbling number! What do you see happening in the future? What are your plans or hope for this year? Where do you hope to be in five year? Our mission is to help reveal and relieve an ocean underseige with a tide human waste. In the short term, our goal is to use technology to coordinate cleaning and conservation efforts. In the medium to long term, as our data becomes more detailed, we can target specific campaigns and policies to prevent our oceans from being polluted in the first place. Alongside this, we hope to share what we learn through this project, working to educate and engage the public in the importance of recycling. We have our first prototpye of the algorithm thanks to amazing efforts of The Plastic Tide’s science advisors and team, together with the humbling efforts of our awesome citizen scientists. We are setting up field trials to test the algorithm rigorously in the real world. In the next year, we will aim to have completed the first set of trials along coastlines. At first we're using ordinary imagery based on visible light, but we would like to explore the use of cutting edge hyperspectral and multispectral imagery in combination with machine learning to extend the projects' operational area from coastlines to the ocean's surface and the sea floor. In 5 years, our ambition is to be operating on global coastlines, seafloor, sea surface, and inland river systems, revealing reveal the full scope of the plastic tide afflicting our marine environments. What, if anything, can people who are interested in helping your cause do to pitch in? Last but not leat, think about how you use plastics and where you can reduce waste. For example, switch to reusable cups and bags. Trying making a lunch for work without any single use plastics. Share your journey on social media and help others understand the problems. Talk to your friends and family about this issue, and tell your local politicians that this is concerning you and tell them to do something about it. Share your frustration with companies with their packaging. Every little bit helps.